Hello, during the last weeks we have been working on Knitlib and Knitpat, a knitting machine control library and a standardized format that allows for exchange and storage of patterns. In order to achieve a common platform for knitting machine development we have the need to abstract away implementation details that can difficult the generic usage of the lib, while keeping extensible and powerful control features. Among the most important abstractions developed for Knitlib is the Knitting Machine Finite State Machine, an abstract representation of the procedures needed to operate a knitting machine. BaseKnittingPlugin, the basis of knitlib’s machine knitting controller plugins. The architecture of Knitlib allows for easy integration of different knitting machine plugins for varied use cases, hardware, and software protocols. All functions of the plugin are non blocking except for .knit(), which is blocking due to the physical interaction needed in order to execute this command. To ease usage and to enable more versatile behaviour from the .knit() function, without limiting the interaction facilities needed for operation, the callback infrastructure allows for blocking and non-blocking callbacks from the Plugin to the machine operator (the Knitlib client), such as Information, Warnings, Error Notifications or Mechanical Required Actions (moving spools, switches, needles, etc). Callbacks abstract away the notification and interaction paradigms from the plugin, allowing for simpler behaviour, a more elegant design and ease of testing. Callbacks also allow for future plugins to not take care into implementing user interfaces, but to focus on functionality. The pending remaining challenge is to standardize configuration options, flags and settings in order to allow for UI that respond to each plugin requirements and options, and to specify which features are supported on each machine plugin. Insofar, most of the standardization has been done on Knitpat, but some specifications such as physical resource assignation (Serial Ports, input streams, etc) are still to be implemented soon. Thank you, and I hope this article helps you to understand the software architecture and design patterns of the implementation of Knitlib. Hi Everyone, I am Sameera Gunarathne who is a participant for GSoC ’15 for FossAsia under fashion and technology. 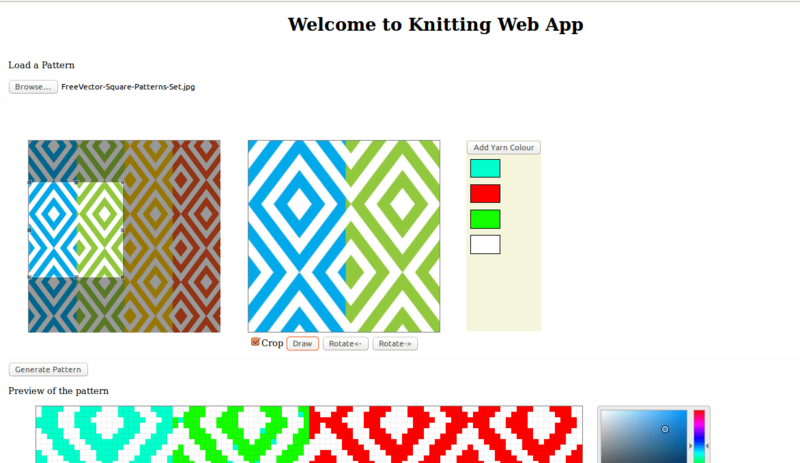 I am developing web based GUI for knitting applications. Today I am going to talk about importance of integrating a pattern editor inside knitting applications and little bit about my work on the pattern editor implementation. Why knitting application should have a pattern editor? It’s to simply give the user capability of doing all the editing work on the pattern before it is sent for knitting. Therefore user will be able to proceed the whole knitting process using one application. User doesn’t have to use a separate application to edit the pattern and then import the pattern to the knitting software to get knitting done. Also most these pattern editor applications are commercially available which means user has to pay for the application and its updates. So that’s extra money. 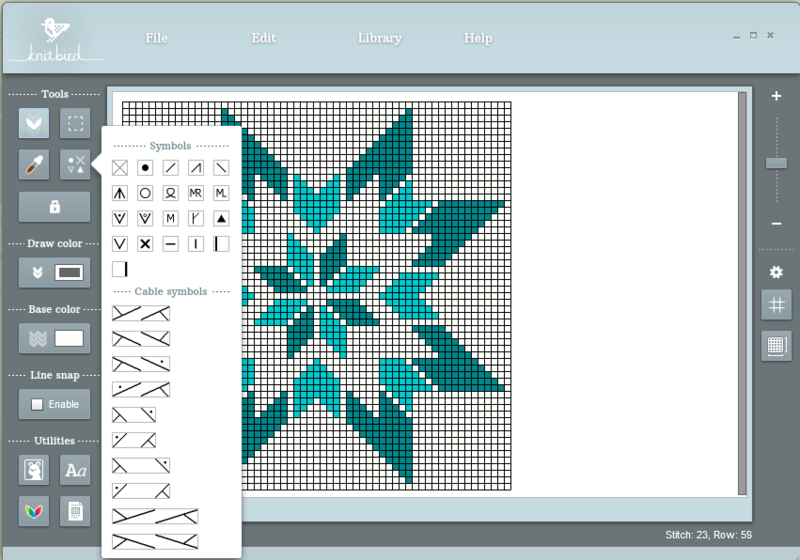 Some examples for available pattern editor softwares are knitbird , envisioknit , stitchmastery etc. 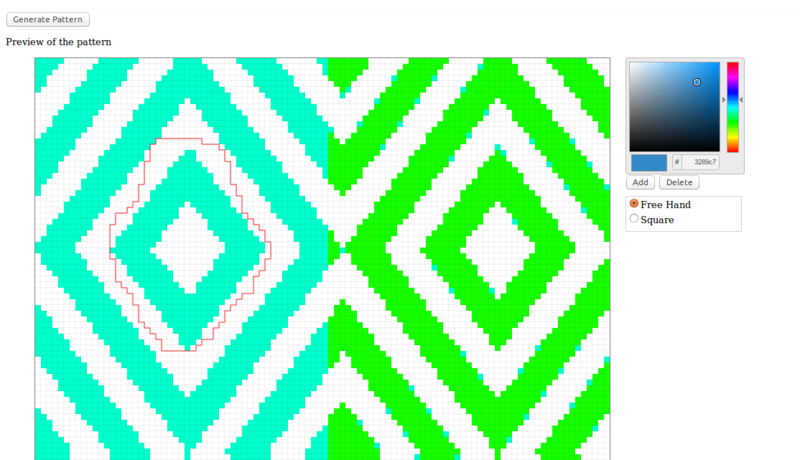 So what about open source knitting machine software with a feature rich pattern editor? Cool right. I am working on integrating feature rich pattern editor for the knitting web application that I am developing for FossAsia this GSoC. 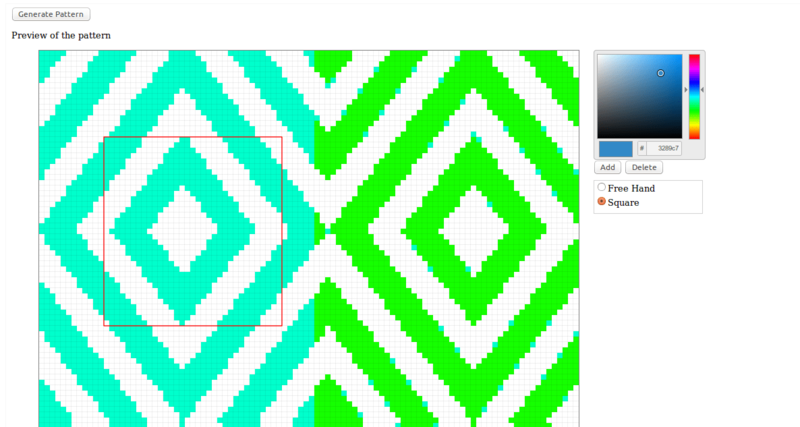 Following features are already added to the pattern editor implementation. 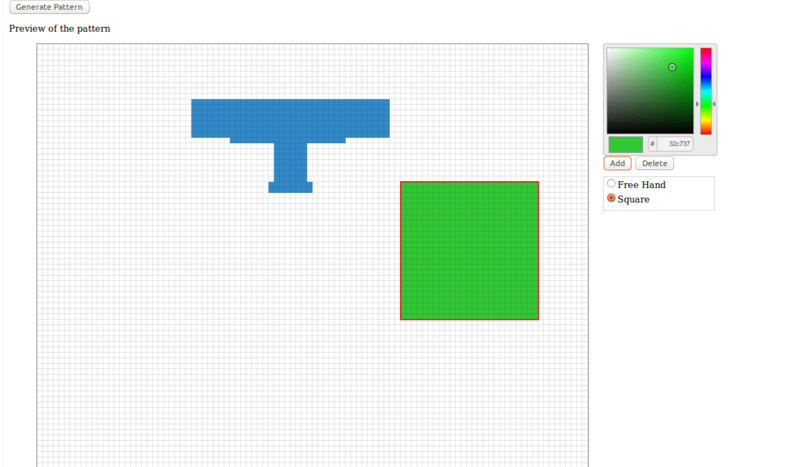 Getting a loaded pattern to a pixelated grid to give user a easily editable interface. 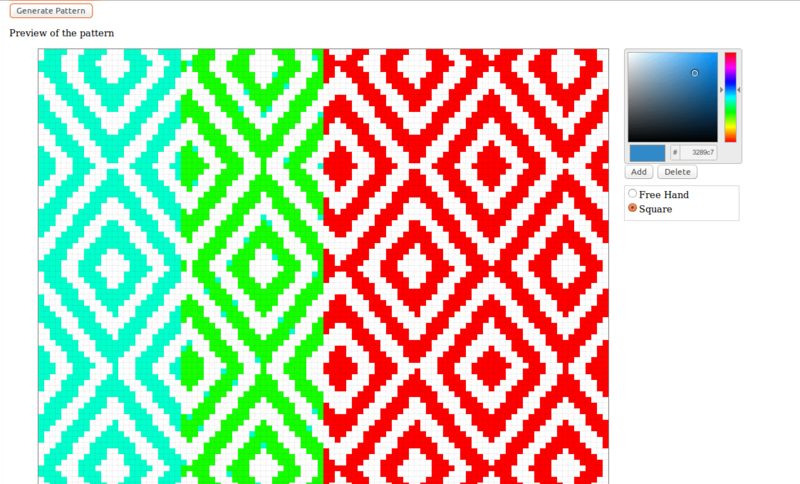 Pixelated pattern can be generated from available yarn colours that used for knitting. Cropping tool for load necessary parts from the pattern. Rectangular/Free Hand selection of loaded pattern. Editing colour details of a selected area of the pattern. User is given capability to regenerate the pattern according to the available yarn colours for the knitting. This functionality allows user to understand how the actual knitting output will be there with the available yarn colours. Below are the some of screen shots of current implementation. I am very much enthusiastic on the project and working hard to get a good outcome for the knitting web application implementation. See you with the next blog post update. Thanks :). Hi everyone, I’m Shiluka Dharmasena, Computer Science and Engineering undergraduate from University of Moratuwa, Sri Lanka. Thanks very much for this great opportunity to get involves in FOSSASIA open source project and I’m keen to give my fullest contribution to the FOSSASIA. For GSoC 2015, I am developing a library to support knitting machines. It’s great to work with FOSSASIA team under awesome mentors Mario Behling and Christian Obersteiner. This is the Initial suggestions for the project. There are several dependency libraries which ayab has such as pillow, pyserial, wsgiref, fysom and yapsy with relevant versions. These dependencies should be added to the library. Installation should be well documented in step by step. Additionally I suggest to add GUI based installation with usability improvements with standard installation procedures. Use a python test framework like unittest to test the python library. It supports test automation and aggregation of the tests into collection. Documenting Class definitions, methods definitions and links to the given source codes. Hi everyone, I am Sameera Gunarathne and I am a computer science undergraduate of University of Moratuwa, Sri Lanka. This is the first time I have applied for the GSoC and FossAsia and I am quite excited to give my contribution to FashionTec as it’s a whole nice new experience that programming is applied with real world applications in fashion and technology paradigm. 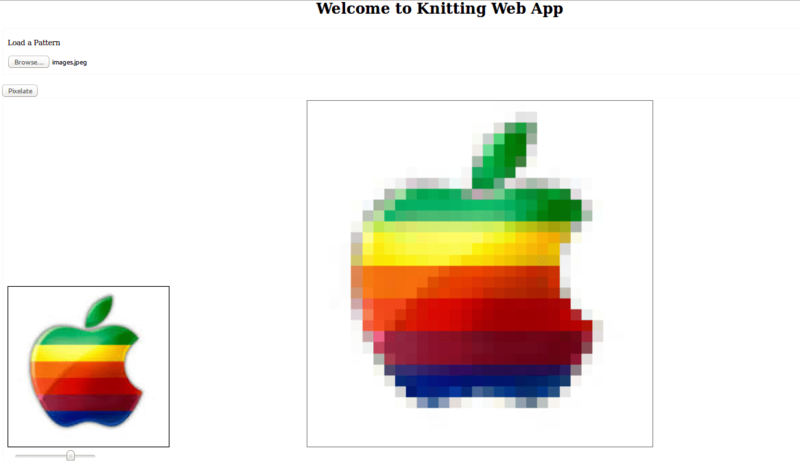 I have selected for developing a Graphical User Interface which runs as a web application which is intended to provide a common platform to give input for the knitting machine firmware. As the first step I had to research on the existing knitting applications that are available online commercially and what they provide as features that still need to be included in open source knitting applications. I have looked into both knitting pattern design softwares and knitting machine embedded softwares including knitbird, EnvisioKnit ,Stoll knitting software, ShimaSeiki SDS One Knit. The most significant feature I have noticed is the feature rich pattern editor provided with the software. They provide features like loading patterns from different formats(jpeg, png,gif,pdf), transform patterns(crop,replicate etc) to create new patterns, drawing tools to create a pattern from scratch, Provide colour palette with available yarn carrier colours, Saving and loading the work done by the user in the application storage etc. Therefore in this GSoC period I am developing the assigned Web User Interface with consisting of following components. Knitting Simulator is used to simulate the knitting process through the user interface while the knitting is going on. It will display the carriage details, current knitting progress and a graphical simulation of the current knitting position of the pattern with row details. Project Manager component is to save knitting works as projects and load them later as the user preference. This project consists of 4 milestones and under the first milestone I am working on the pattern editor features. Currently I have implemented loading different types of patterns into the workspace and pixelate them according to the number of rows and stitches allowed for the knitting. Following tasks will completed end of this week. 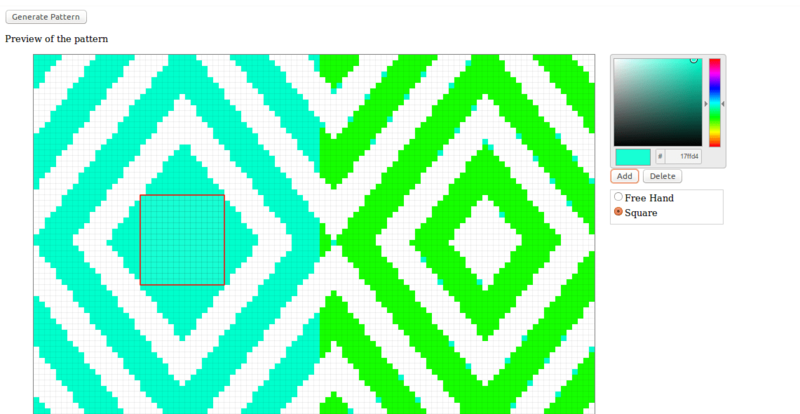 Identifying individual pixel in the grid as a stitch and add operations such as change colour, size etc. 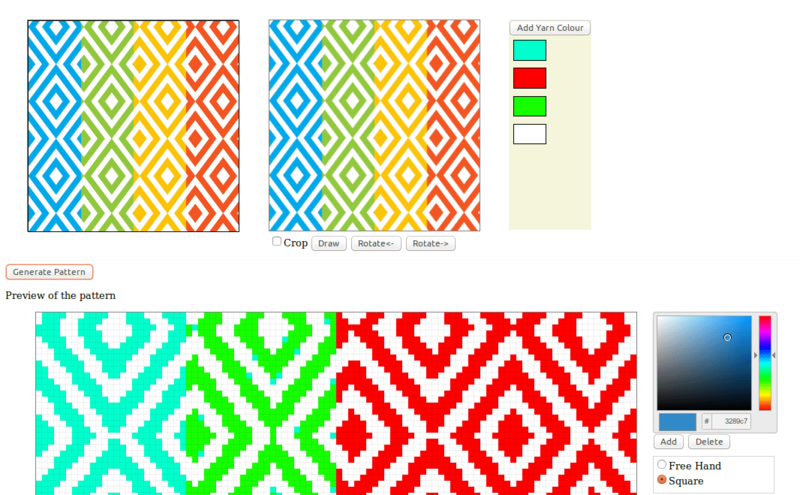 Adding pattern editor tools for selecting pattern area, colour picker, crop-cut-paste tools for pattern replicating. I hope this GSoC will be a fruitful one to spend with a successful implementation of the knit web app and looking forward to provide a competitive open source knitting software at the end of the development :). Hello everyone, my name is Sebastian Oliva. I am a developer from Guatemala and part of the team of students currently in Google Summer of Code ’15 working on Fashiontec. During last year’s GSoC I built a GUI interface for the AYAB project, allowing for easier control for knitting machines supported by AYAB (Brother KH-930, KH-910). When I started getting involved with Fashiontec and FOSSASIA last year I was not aware of the large community related to textile and open fabrication projects. Since then, I have found many projects that have focused on different techniques and have had different approaches to fabrication and in particular the operation of knitting machines. Such as projects that emulate existing functionality of an existing machine, projects that entirely replace or enhance the machine’s inner workings, and projects that build machines from scratch. Currently I am working on developing a knitting machine abstraction library and JSON based knitting file format that can enable the use of a single API to control a varied number of knitting machines. A knitting machine library allows us to create even more advanced software to control and operate machines, while a standardized and open format for knitting patterns allows us to create pattern collections such as the common pattern books usually shared by knitting communities, as well as enabling pattern editors and ecosystem. Working on designing and implementing Knitlib’s API design. Writing tests for Knitlib’s desired behaviour. Starting work on defining Knitpat, the open knitting file format. I hope that this year’s GSoC brings a lot of advances to the machine knitting community, and I am happy to be a part of it.